Koji Uehara blew a save Saturday night when in the bottom of the 10th, the Orioles’ Adam Jones tripled when Allen Craig lost his liner in the lights, Chris Davis hit a sacrifice fly, and David Lough hit the first walkoff homer of his career. Every closer blows saves, so it’s no big deal, right? 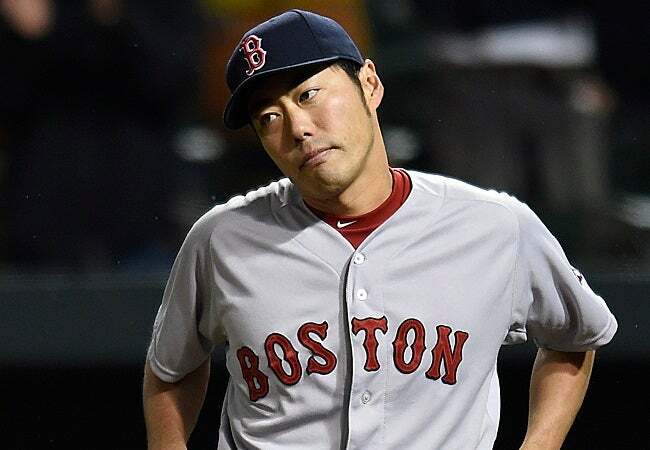 First, when you have a starting staff as shaky as Boston’s, there is an increased pressure on the bullpen to excel, but this is about Koji and the difference that is discernible when you look closely at his numbers and you see this is not just a 2015 problem. Yes, the samples are small, but that is the nature of closers. Last April, Uehara did not start the season on the disabled list; he started by appearing in 10 games, throwing 142 pitches. This season, Uehara started late and has appeared thus far in five games, throwing 72 pitches, basically half of 2014. •	In 2014, Uehara’s batting average against was .211, this season, it’s .313. •	In 2014, his overall velocity was 84.6 mph, in 2015, it’s 79.5 mph. •	In 2014, 62.0 percent of Uehara’s pitches were fastballs and 37.3 percent were splitters (one pitch was recorded as a slider). This means that Uehara was working his fastball (87.8 mph) to set up the splitter (79.3 mph). •	This season, only 15.3 percent of Uehara’s pitches are fastballs (86.1 mph) and 84.7 percent are splitters (78.3 mph). Which shows the lack of confidence that Uehara has in his fastball. Pitchers like Aroldis Chapman that throw pitches around 100 mph can make mistakes with location and often get away with it. Pitchers like Uehara can’t. Picture the left-handed batter facing Uehara, the right-handed pitcher. The batter sees the pitch coming right down the heart of the plate and then he swings over the pitch, because it’s splitter that has dropped off to the outside corner. He doesn’t have chance. On the other hand, if he looks for the splitter down and away, he is absolutely flustered by a fastball remains up in the zone, pretty close to the middle of the plate. It’s an amazing formula for success…when executed properly. But trouble when it’s not. •	Last April, Uehara threw 56.8 percent of his fastballs in the zone and 42.0 percent up in the zone (note the variation of location). Batters swung and missed 34.9 percent of his fastballs, and went 5-for-17 (.294) with a homer, four whiffs and a walk. •	This April, he has thrown 54.5 percent of his fastballs in the zone and 54.5 percent up in the zone (note the lack of variation). Batters have swung and missed 20.0 percent of his fastballs, and have gone 1-for-1 (.1000) with a single. The fastball appears to be less of a temptation. •	Last April, Uehara threw 43.4 percent of his splitters in the zone and 58.5 percent down in the zone. Batters swung and missed 56.4 percent of his splitters, and went 3-for-21 (.143) with three singles and 13 strikeouts. Batters chased 63.3 percent of the splitters he threw. •	This April, Koji has thrown 36.1 percent of his splitters in the zone and 80.3 percent down in the zone. Batters have swung and missed 54.3 percent of his splitters, and have gone 4-for-15 (.267) with a triple, a homer, and six strikeouts. Batters have chased 48.7 percent of the splitters he has thrown. Batters are less tempted and less fooled by the splitter that is located farther down and farther away, and less frequently appearing to be in the strike zone. Uehara struggles became apparent at the end of last season, but by that time, the Sox were going nowhere other than the American League East cellar. But if you look carefully at last season, you will clearly see his issues began earlier than September. In fact, the second half of his season resembles his troubles thus far this season. •	Last June 16, Uehara in 31 games had an incredible 0.57 ERA, 0.663 WHIP, and a .159 BAA. It was very unlikely that any pitcher could continue at that rate, but the rest of 2014 proved to be dramatically different. •	From June 18 on, Uehara in 33 games had a 4.41 ERA, 1.163 WHIP, and a .264 BAA. •	This season, in five games he has a 4.15 ERA, 1.154 WHIP, and a .313 BAA. Uehara’s ineffectiveness is continuing. It cannot be overlooked and Red Sox Nation should be really concerned.